Jason Kidd helps cool the burn of Steve Nash leaving the New York Knicks by agreeing to sign their multi-year offer. 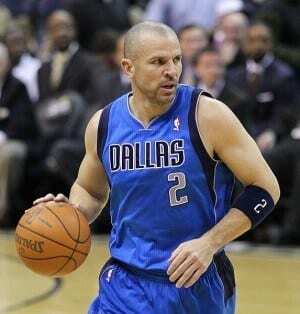 Kidd has decided to leave the Dallas Mavericks and will be playing point guard in a Knicks jersey this coming up season. The Mavericks were shocked with Jason Kidd’s decision as they were confident with his return to Dallas with a verbal agreement on a three-year contract worth $9 million. However, after all-day negotiations with both teams, Jason Kidd decided to leave the Mavericks to join the New York Knicks for a similar deal. Kidd can’t sign the contract until July 11, which is the first day new NBA contracts can be signed. According to ESPN.com, Kidd decided to join the Knicks in New York to take on the challenge of helping the team move into the Eastern Conference elite. Just as Jason Kidd committed, Knicks point guard, Jeremy Lin, agreed to an offer with the Houston Rockets, complicating the Knicks’ future plans. However, because Lin is a restricted free agent, the Knicks have the opportunity to match the deal in order to try to keep their promising 23 year old point guard. Aside from Jason Kidd being beneficial on the court with his playmaking ability, the Knicks are also certain that Kidd would be a great mentor for Jeremy Lin. As he is entering into his 19th season, Kidd’s days as an elite point guard are over. However, the New York Knicks are confident in Jason Kidd’s ability to provide quality minutes and help further Lin’s game.